It’s not breaking news that while many of us make New Years resolutions, most of us don’t keep them. Maybe part of the reason for that ongoing dilemma is that we make too many resolutions. Perhaps success would be more likely if we narrowed our focus down to what matters most. It improves your chance of success. If you accomplish your goal early in the year, you can move on to another one. Of course, when you choose your one and only New Years Resolution, it’s important to pick the right one. It can’t be too broad or too unrealistic. I recommend using the S.M.A.R.T. goal acronym to help you choose one. When your goal is specific you’re making the statement, “I want to lose 25 pounds,” instead of simply saying, “I want to lose weight.” The more specific your goal is, the more actionable it is. The example above about losing weight is also measurable. You want to be able to track your progress to make you more likely to stick to your resolution. This is why a service like NutriSystem is so helpful when trying to lose weight because they help you tangibly measure your goals while also providing accountability. Once you have a specific, measurable goal, you can break down the goal into smaller goals. For example, if you want to pay off $6,000 of debt in 2018, you can make it a goal to pay off around $500 of debt each month. Then, you can track your debt repayment each and every month to keep you motivated and ensure you’re on track. The key with paying off debt, for example, is finding the right tools to help you optimize your efforts. One way to do that with debt repayment is consolidating your debt to lower your rates. Avant is one option to help you slash rates and kill debt faster. Losing a lot of weight or paying off debt might seem overwhelming if you’re not ready for it. That’s why it’s so important for your one and only resolution to be achievable. It’s great to set a stretch goal, but if your goal is too big or too broad, it’s easier to get discouraged and abandon it altogether. So, make sure you set goals that are healthy, like losing one pound a week or goals that are possible, like setting aside an extra $100 per month in a high yield savings account like Ally to grow your savings. The next part of a resolution that is S.M.A.R.T. is to choose a goal that is relevant to your life. This is your “why;” your reason for wanting to improve. When you’re choosing a goal, it shouldn’t be arbitrary. For example, if you want to reach health goals, perhaps it’s relevant because you’re trying to live longer or trying to improve chronic pain. If you want to reach financial goals, perhaps it’s because you want to save enough money to take your wife on a trip or save for your kids’ college fund. Whatever it is, think about why this goal is your number one resolution for the year and what it will mean to you if you achieve it. Here are 35+ ways to save money every month that can give you some ideas of how to start saving. Lastly, when it comes to your New Years resolution, make sure it’s time-bound. People tend to achieve goals faster when there’s a deadline involved. So, be sure to break down your goal into smaller, bite-sized chunks with specific dates attached to it. Of course, if you don’t meet your self-imposed deadlines, don’t beat yourself up over it. Simply adjust your calendar and try again. The best way to actually achieve your New Years goals is to keep working on it, even if you encounter hiccups along the way. Ultimately, I’m a huge fan of setting one goal for each year. No one wants to be *that person* who talks about New Years resolutions but never actually reaches them. By setting one goal, you’ll be much more likely to achieve it. If the goal you pick follows the S.M.A.R.T. acronym then you’ll be even more likely to accomplish it in a specific amount of time. Plus, once you do, you’ll improve your life because your goal was relevant. Are you setting one New Years resolution? Or, do you usually like to set a few? How do you set and achieve goals? What works for you? What New Years resolution are you most proud of achieving? 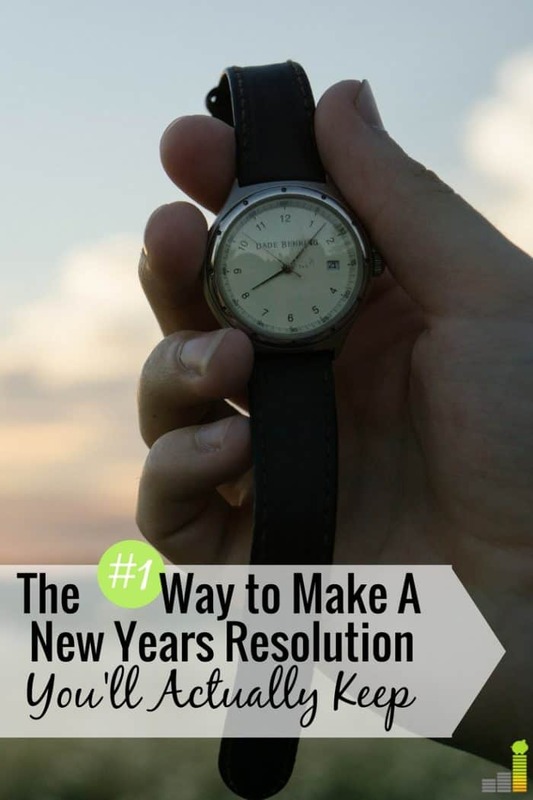 The post How to Make Your New Years Resolution Stick appeared first on Frugal Rules.